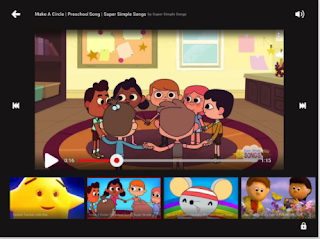 YouTube Kids is a wonderful Google app designed specifically for younger minds. We have already reviewed it in a previous post in the past and today we are re-featuring it again for those of you who haven’t seen it yet. YouTube Kids provides kids with a safer environment where they can search for, access, and explore relevant video content. ‘Parental setup is needed to ensure the best experience possible for your child. -YouTube Kids contains paid ads in order to offer the app for free. Your child may also see videos with commercial content from YouTube creators that are not paid ads. For more information, please check out our Parental Guide. -Videos in the app are selected by our automated systems. Please note, no system is perfect, and it’s possible that your child may find something you don’t want them to watch. If your child finds a video that you feel is inappropriate, please flag the video and it will be reviewed as soon as possible. -You can restrict your child’s experience by turning search off in the set-up flow or by accessing the settings behind the grown-ups-only lock. This means your child can’t search for content, which reduces the chances that they will encounter a video you don’t want them to watch.